In sixth pAsuram, parAnkuSa nAyaki‘s friend says “If you set out to apply just the dust from the lotus feet of SrIvaishNavas, that will be the remedy; there is no other remedy for her disease”. Subsequently, parAnkuSa nAyaki‘s friend says “By your constant engagement with these other dhEvathAs, her disease is only worsening and not improving; hence, you set out to apply the dust from the divine feet of bhAgavathas who are related to sarvESvara, who has distinguished forms”. Sixth pAsuram. parAnkuSa nAyaki‘s friend says “These huge efforts are not required; knowing exactly what is said as “thavaLap podi” and starting to engage with that will cure her disease”. Oh mothers! Without break you are all engaging in worshipping this [petty] dhEvathA; having that as the reason her disease is only worsening and not getting cured; if you try to apply on her, dust from the divine feet of bhAgavathas who are well aware of their subordinate relationship with krishNa who is having unsurpassed distinguished complexion more than a blue jewel,you would see that there is no other matching remedy existing for this divine natured girl (parAnkuSa nAyaki). thaNiyum … – As there are those who would stop them from engaging in the worship of such petty dhEvathA, and since they did not know when they will be asked to stop, they continued their worship without a break. piNiyum … – With more engagement in the cause [association with other dhEvathA], the effect [disease] also became worse. perugum idhu allAl – Like an overflowing flood, the disease worsened. 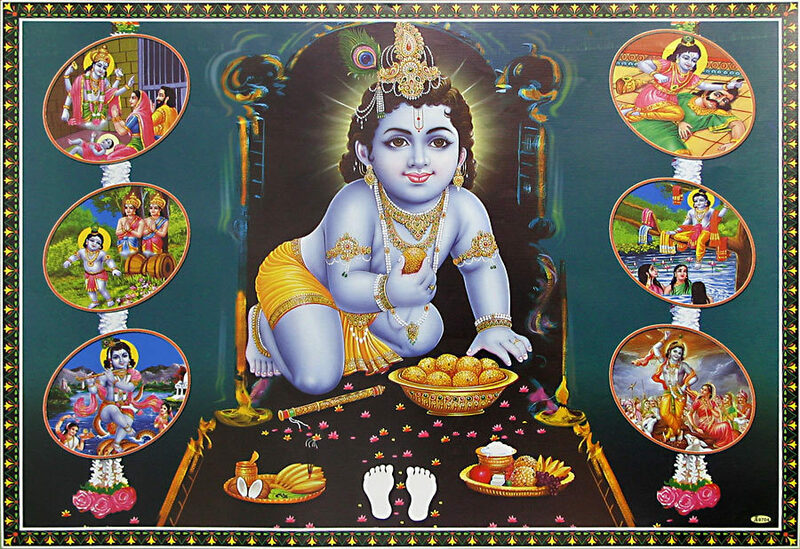 maNiyin … – If you set out to apply the dust from the divine feet of devotees of emperumAn who is having beautiful complexion as that of a blue jewel, is amazing due to his qualities and activities. Since this is a mistake which happened to the one who is born in viSishta (prapanna) kulam (the clan of surrendered persons, which is most disciplined), we suggested the atonement with great intent; but if you look at the greatness of the process [dust from the divine feet of bhAgavathas], just starting to pursue it in itself is sufficient. kulaSEkara AzhwAr too said in perumAL thirumozhi 2.2 “thoNdaradip podi Ada nAm peRil gangai nIr kudaindhAdadum vEtkai ennAvadhE” (When we can bathe in the dust from the divine feet of devotees of SrIman nArAyaNan, why would we have the desire to bathe in gangA?). ahirbhudhnya samhithA 37.27 and 37.28 “AnukUlyasya sankalpa: prAthikUlyasya varjanam … ” (six aspects of SaraNAgathi are explained in these SlOkams, the first two being – vowing to act favourably and refraining from unfavourable acts) – for favourable aspects just vowing to engage is sufficient [here to accept the dust from the divine feet of the devotees, just the vow is sufficient], but for unfavourable aspects, one must physically give those up. mAyan thamar adi nIRu koNdu – Recollect piLLai uRangA villi dhAsar’s remedy for his nephews vaNdar and soNdar when they were misled by the king. That is – when agaLanga nAttAzhwAn mischievously showed vaNdar and soNdar the lions placed on the towers of a jain temple and told them “thirumuRRam; thiruvadi thozhungOL” (this is a divine abode of emperumAn; offer your obeisances), they believed him to be telling the truth and at once offered obeisance. But soon they realized that it was a jain temple and fell unconscious. Hearing about the situation, piLLai uRangA villi dhAsar [arrived there and] applied the dust from his divine feet on their heads and they regained consciousness. [nampiLLai says] When nanjIyar was explaining this pAsuram in a protected area near the thirukkottAram (store room) [During dangerous times, lectures are given in secluded/secret locations], when this line was explained by him, I asked “When the cause for the disease is explained as ‘thErppAganArkku‘ (for krishNa, the charioteer), why is ‘mAyan thamar adi nIRu koNdu aNiya muyalin‘ (if you try to apply the dust from the divine feet of the devotees of emperumAn) explained as the remedy?”. He mercifully explained “When a person with some disease cannot consume curd which is the medicine, he will first be given dry ginger to prepare him and will then be given curd. Since, when “thErppAganArkku” was said, she could not bring emperumAn there, so initially, she is pacified by applying the dust from the divine feet and will subsequently be shown emperumAn“. maNiyin … – She became unconscious thinking about emperumAn’s saundharyam (beauty), Seelam (simplicity) etc; you too bring the dust from the lotus feet of the SrIvaishNavas who are captivated by emperumAn’s beauty, simplicity etc., and try to give the remedy for her. The disease will break into pieces; when the podi (dust) is applied, the disease will be cured. maRRa … – For parAnkuSa nAyaki who is distinguished to be cured only by this remedy, you try to apply only this as the remedy. This entry was posted in thiruvAimozhi, thiruvAimozhi 4th centum on March 6, 2017 by Sarathy Thothathri.